India has fallen behind in both health expenditure and health outcomes compared to other lower-middle-income countries. Its burdens of tuberculosis and malaria, and increasingly noncommunicable diseases like diabetes, are among the largest. Infant mortality and child malnutrition rates rival those in sub-Saharan Africa. Public expenditure on health—a mere 1.2 percent of GDP—is less than one-third of South Africa’s and share of out-of-pocket cost is the highest among G-20 countries. On the other hand, India’s thriving medical tourism industry generates revenues of over $70 billion a year—that’s equivalent to one-third of all public expenditure on health in India. It’s clear there’s a high level of inequity in health access and outcomes that must be remedied as a matter of priority. India’s new draft National Health Policy begins to address some of these problems, outlining a series of much needed reforms. The draft policy appreciates the urgency to achieve universal health coverage—access to quality health care for all without increasing financial burden on individuals and families. It further recognizes the need for higher levels of public expenditure, makes improvements to primary health-care delivery, moves toward a purchaser model for health-care services including both public and private providers, and expands coverage of a national health insurance program targeting the poor. These are all laudable policy initiatives; however, they don’t go far enough. And more importantly, the policy lacks clear direction in terms of health system design and in coverage of individuals and services. Set a target of at least 5 percent of GDP for public expenditure on health. Move money to the states by providing incentives for performance-based health outcomes. Design a prioritized, cost-effective, and fiscally sustainable benefits package of health-care services. Effectively monitor health outcomes by creating a comprehensive database of electronic health records and financial performance. In our submission (abridged version here), we argue the National Health Policy’s target of 2.5 percent of GDP for public expenditure on health is too low. While it is an increase from current expenditure, it still will not be adequate to address the burden of disease, fill infrastructure and human resource gaps, and reduce out-of-pocket expenditure, especially for the poor. For comparison, middle-income countries such as Mexico and Thailand significantly increased their public expenditure in health to 6.3 and 4.1 percent of GDP, respectively, when they made major pushes toward universal enrollment in government-led insurance programs. 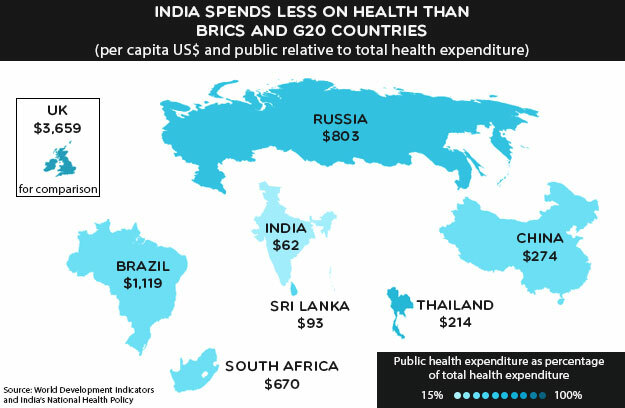 Considering the current infrastructure and human resource gaps, India will need to spend at least 5 percent of GDP on health. Universal health coverage will not be achieved on the cheap. Increasing expenditure is only one piece of the puzzle; spending will also need to be done more effectively. 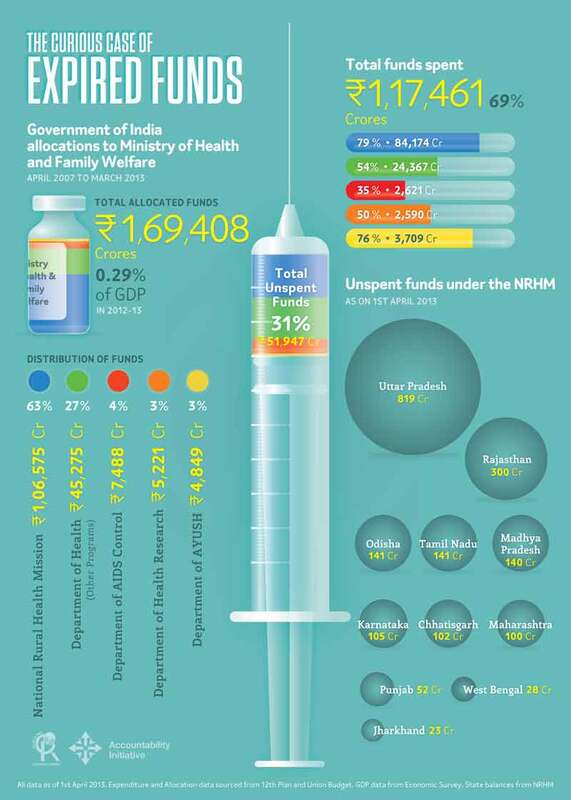 Over the last decade, fiscal transfers through the National Health Mission have been plagued with expenditure inefficiencies. Most states have not been able to utilize funds and are burdened with planning and reporting guidelines imposed by the Central government. This needs to change. States should be given the primary responsibility of implementing the national plan and provided with adequate fiscal space to do so. Greater tax devolution recommended by the 14th Finance Commission is a step in the right direction, as I discussed in an earlier blog. Top-down financing should be replaced with performance-based transfers on the basis of outcomes. The draft policy plan acknowledges this, but fails to explicitly provide how it will move towards greater subnational autonomy and accountability. The National Health Policy should also establish an independent authority to collect, manage, and analyze health data as its core business. This would be similar to the Unique ID Authority of India (UIDAI), which issues the biometric Aadhaar number. It should be a professionally managed nodal agency that collects data from all levels of government and the private sector, providing data warehousing services for electronic health records and the Health Management Information System, and evaluate performance at State and district levels. India could learn from the experiences of the Mexican Social Security Institute and the National Health Security Office of Thailand, which have been relatively successful in this regard. The goal of creating such an entity would be that data-driven, evidence-based policy and fiscal transfers tied to improved health outcomes would change the health landscape of India in the coming decades. It’s been nearly 70 years since the Bhore Committee report laid the blueprint for universal health coverage and more than a decade since India’s last national health policy set ambitious targets for achieving health for all. In the end, what is lacking is the political will to make these reforms happen. Will NHP 2015 deliver equitable and quality health care or will it be more of the same? We’ll have to wait and see.